Lapu-Lapu City is apparently up in arms over a TV commercial that shills diapers and also “gravely insults” the city named after Datu Lapu-Lapu, former ruler of Mactan. The ad, for EQ diapers, implies the Battle of Mactan was not fought because Lapu-Lapu refused to pay tribute to the King of Spain but because Ferdinand Magellan gave him inferior diapers as a gift. Lapu-Lapu City Mayor Paz Razada said in a press conference that “distorting history and making the Battle of Mactan look funny on TV is a lame attempt to promote a product.” She has demanded an apology from the diaper company and wants the ad pulled off the air. “I am disturbed to hear young children talk about the ad and consider it as a true reflection of history,” she also said, which, really, says more about the country’s education system than anything else. If our kids cannot tell the difference between make believe and history, parents and teachers are to blame, not advertising creatives who were only doing their jobs. This isn’t the first time that EQ has gravely insulted history to sell its diapers, either. It has released an ad featuring Cleopatra, which sparked fierce protests across Egypt, and an ad with an Elvis Genie, which doesn’t even really exist. 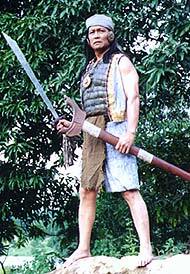 The council has yet to propose and put to a vote another true travesty against Lapu-Lapu, the 2002 Lito Lapid movie of the same name. Guess What? The Cybercrime Law is Totally Legit!